27 April 2019, 7 p.m. The concert will feature young students of secondary music schools with a lot of success at prestigious contests. The opportunity to perform with a fully professional – but also still young – orchestra, composed of tertiary music school graduates, is a token of recognition of the students’ talent and hard work, but also a touchstone of their skills. 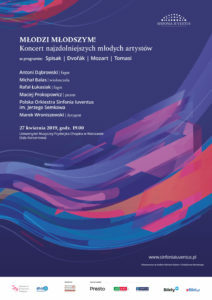 It is certainly worthwhile to come to this concert and support the most talented students – who will presumably quite soon be esteemed virtuosos, sought-after on Polish and international stages! A very attractive and versatile programme is an additional incentive. There are two basson concertos on the programme – Mozart’s classical piece, written at the age of eighteen, is the first of a number of his concertos composed for wind instruments and still the most often performed bassoon concerto of all. Michał Spisak’s piece of 1944 – classicising, graceful and humorous – is an evergreen favourite with Polish bassonists. The composer, slightly forgotten nowadays, belonged to a large group of Polish pupils of the famous Nadia Boulanger, and the love for France which he developed during his studies eventually made him choose it as his country of residence. Trombone has a very long tradition, and since the Middle Ages and the Renaissance it has been most often combined with vocal voices on account of its melodiousness and chromatic playing ability (which natural trumpets and horns of the early period could not provide). Its introduction into the orchestra came late, and it has not been assigned strictly soloist roles very often ever since. The French composer Henri Tomasi dedicated to the trombone what is nowadays one of the best known concertos, giving due weight to its enormous spectrum of expression, its ability to exhibit a lyrical cantilena, which is particularly visible in the concerto’s oneiric first movement and in the subtle nocturne in the second link, but also its virtuoso potential present (even if not in the foreground) in the tambourine dance in the concerto’s animated finale, inspired by the Baroque suites. The final piece is the jewel of late-Romantic cello music, and at the same time the last soloist concerto by Antonín Dvořák – who needed a lot of encouragement, inter alia, from his friend Hanuš Wihan, to overcome his initial doubts whether the subtle sound of a cello was the right choice for writing a concerto. What eventually convinced him about the instrument’s immense inherent potential was his visit to the USA, where he had a chance to listen to the country’s virtuosos – this was also where he wrote his Concerto in B Minor, which had its highly successful world premiere in London in 1896. Since then, his piece has been a fixed element of the worldwide repertoire and one of the most often recorded cello concertos. The concert will be conducted by Marek Wroniszewski, a talented young-generation conductor, recognised as the best Polish participant of the 10th Grzegorz Fitelberg International Competition in Katowice in 2017, presently working as the Deputy Director of the Jerzy Semkow Polish Sinfonia Iuventus Orchestra. and in the bookshop Chopin University Press, Okólnik 2 street.